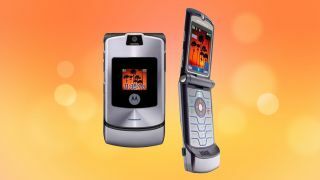 Retro phones may not be the talk of MWC like they were last year (all we have seen is the return of the Nokia 8110) but Motorola's CEO just hinted to TechRadar that its iconic Razr design will soon make a return. Lenovo (which now owns the Motorola brand) CEO Yang Yuanqing spoke to a select group of journalists at MWC 2018 and we took the opportunity to ask him about a potential Razr revival. Last year, he told CNBC that Motorola shouldn't rule out the phone's return, but nothing has been mentioned since. But that doesn't mean the idea of a new Razr has been cut, as Yuanqing explained to us. "With the new technology, particularly foldable screens, I think you will see more and more innovation on our smartphone design," he told TechRadar. "So hopefully what you just described [the Motorola Razr brand] will be developed or realized very soon". He was referring to our question about a possible return for the well-remembered Razr design. We followed up to confirm he was talking about the Razr in particular, and Yuanqing replied: "I think I have already answered the question". Yuanqing's comments have got us thinking just how Motorola could return to the Razr name. He may have been hinting at an updated version of the Motorola Razr (like how the Nokia 3310 2017 returned) but his comment about foldable displays also suggests it may be an entirely new handset instead. Then there could be the possibility that we will get both. If Motorola is experimenting with flexible display technology - like what we've seen rumored for the Samsung Galaxy X - it may be the company will make a new phone line and use the Razr branding for it. The Motorola Razr V3 had an iconic design that many remember fondly, so it'd make sense for the company to lean into the affection tech fans have for the phone from 2005. MWC (Mobile World Congress) is the world's largest exhibition for the mobile industry, stuffed full of the newest phones, tablets, wearables and more. TechRadar is reporting live from Barcelona all week to bring you the very latest from the show floor. Head to our dedicated MWC 2018 hub to see all the new releases, along with TechRadar's world-class analysis and buying advice about your next phone.